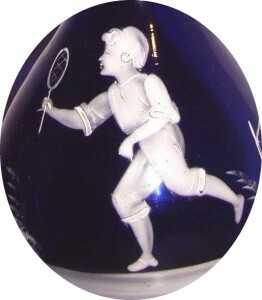 Mary Gregory Glass is a charming style of enamelled figure glass, popular in Victorian times and now being re-discovered. The distinctive feature of Mary Gregory Glass is the painted and enamelled scenes of Victorian children in silhouette, dressed in their best clothes, playing games and having fun. (see below for example Mary Gregory scenes). 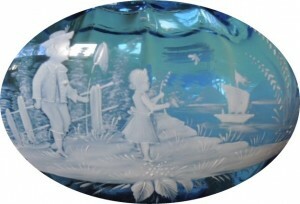 Pictured: Mary Gregory blue glass vase featuring etched boy and girl by a river. Sold for $455 (£375) on ebay.com January 2017. The commonest scenes are children holding of flowers, but there are many more lively occupations: fishing, catching butterflies, blowing bubbles, bowling a hoop, watering the garden, flying a kite, sailing a boat. The children can be found standing, sitting, running and lying flat on their stomachs. They climb trees, tend sheep, unkindly carry birds on strings and play a variety of games. 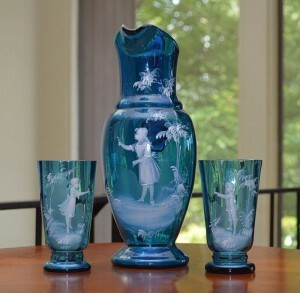 However, the name Mary Gregory is misleading being both a designer and the generic name given to the style of glass from around 1850 to 1900, and from both Europe and America. 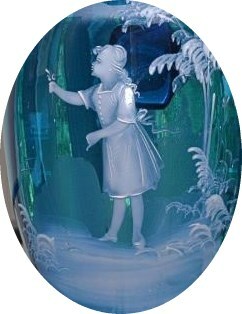 Miss Mary Gregory (1856-1908) was an enameller, working in the 1870s and 1880s, decorating glass for the Boston and Sandwich Glass Company. Pictured: Mary Gregory cobalt blue pitcher and pair of glasses. The pitcher features a girl holding flower surrounded by ferns, and pair of glasses feature boy and girl facing each other and offering flowers. Sold for $174.95 (£143.67) on ebay.com January 2017. Ornamentation on European Bohemian coloured glass became popular during the mid-19th century. 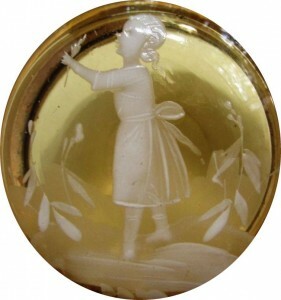 It was between 1850 and 1860 that child figures were first used in this kind of decoration, and with much delicacy and grace. White enamel was chiefly used and was laid on heavily and lightly, with skilful brush-work, to produce at best an almost stereoscopic effect. 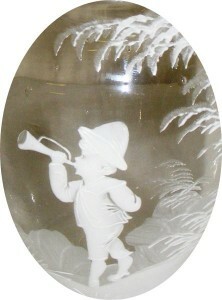 Pieces from this period include decanters, jugs, drinking glasses, bottles and boxes, vases, trays and many other useful and ornamental vessels which were made in a diversity of colours, and showing a variety of the children in differing scene, but with a marked kinship between them and a sameness in the treatment of their rustic settings. Pictured: 1800’s Mary Gregory emerald green pitcher. 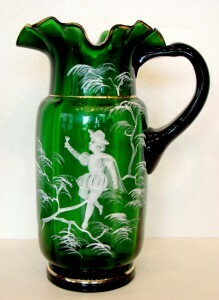 Original c1800’s Emerald Green water pitcher, with a handpainted white enamel scene. Ruffled rim, applied handle, and pontil mark on bottom. Sold for $465.00 (£371.60) on ebay.com December 2016. 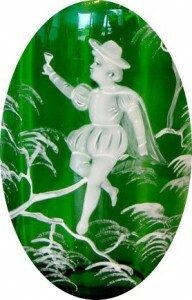 In a search for documentary evidence about the production of glass decorated with child figures the only reference to be found came from America, where the name Mary Gregory has become a generic name for all the glass within the Victorian age which is enamelled with figures of children. Carl W. Drepperd refers to it as such in ” The A.B.C. of Old Glass ” (1947) and Mrs. Ruth Webb Lee, in her ” Nineteenth Century Art Glass ” (1953), gives an account of her research into the person of Mary Gregory and a page of illustrations of Mary Gregory style glass from an American collection. So, by a strange stroke of fortune, this name has come to cover the somewhat earlier and the finer European child figure glass: the only known artist now stands in history for the earlier nameless ones. In descriptions of glass pieces will be Mary Gregory style, Mary Gregory manner, or in the manner of Mary Gregory for example. 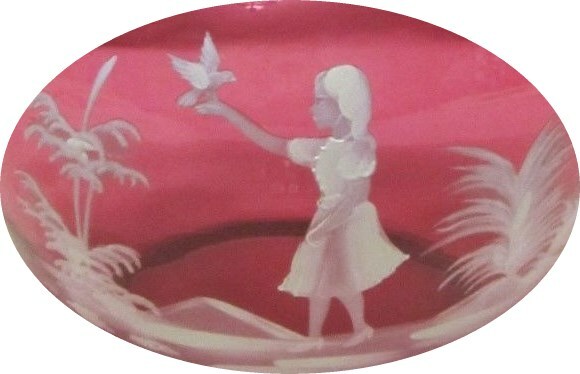 So, paradoxically, the finest examples of Mary Gregory glass are Bohemian from factories such as Hahn and Moser, and date from the middle of the nineteenth century onwards. The different kinds of Mary Gregory style vessels seem to have no end: in fact, almost any object made of glass could be so decorated. There is also diversity of colour of pieces. Red is much sought after, and is to be found in all shades from a rich ruby, through. cranberry to palest pink. The glass may be flashed or stained with copper red or even painted, and there are shaded reds developed with the use of gold. The cobalt and turquoise blues, and the viridian, apple and canary greens show much diversity, even to a shading from clear to canary glass which may have entailed the unusual use of silver. Amber Mary Gregory glass is to be found and, very occasionally, a fine, light amethyst. Sometimes high quality pieces of clear glass turn up, but more often the colourless pieces are debased examples. When the enameller has stretched his terms of reference to include coloured faces and hair and even clothes, this extravagance seems rudely to sever the decoration from the simple beauty of the glass design. Again, except for some of the earliest Bohemian pieces, this use of colour in decoration is usually only found on debased examples. 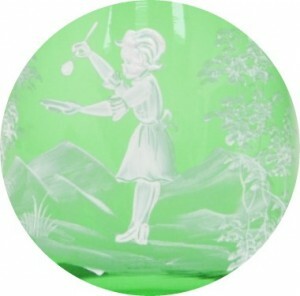 Mary Gregory glass is still, from the collectors’ point of view, not too easy nor yet too difficult to find. Its painting gives it an aura of intimacy and it has a pliable decorative value which makes it at home in any environment. 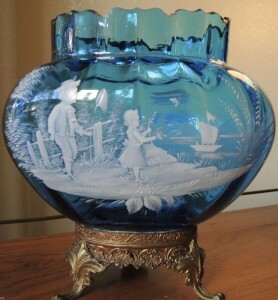 Carnival Glass – The American Influence? Kitchenalia – What’s Cooking In The Kitchen?